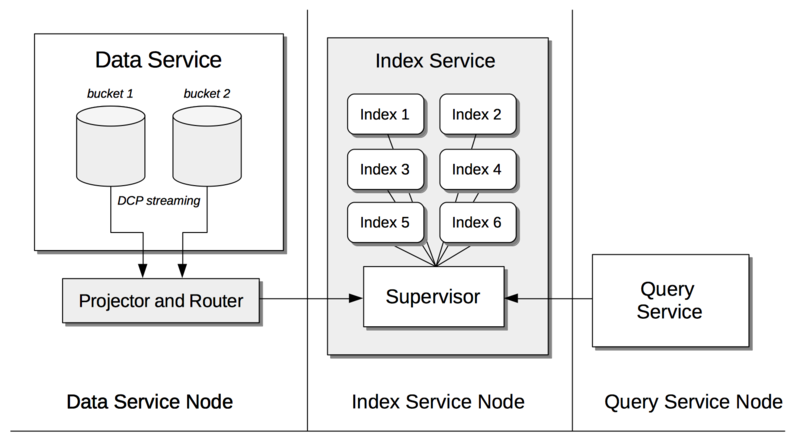 The Index Service supports the creation of primary and secondary indexes on items stored within Couchbase Server. Data Service: Uses the DCP protocol to stream data-mutations to the Projector and Router process, which runs as part of the Index Service, on each Data Service node. Projector and Router: Provides data to the Index Service, according to the index-definitions provided by the Index Service Supervisor. When the Projector and Router starts running on the Data Service-node, the Data Service streams to the Projector and Router copies of all mutations that occur to bucket-items. Prior to the creation of any indexes, the Projector and Router takes no action. When an index is first created, the Index Service Supervisor contacts the Projector and Router; and passes to it the corresponding index-definitions. The Projector and Router duly contacts the Data Service, and extracts data from the fields specified by the index-definitions. It then sends the data to the Supervisor, so that the index can be populated. Subsequently, the Projector and Router continuously examines the stream of mutations provided by the Data Service. When this includes a mutation to an indexed field, the mutated data is passed by the Projector and Router to the Supervisor, and the index thereby updated. Supervisor: The main program of the Index Service; which passes index-definitions to the Projector and Router, creates and stores indexes, and handles mutations sent from the Projector and Router. Query Service: Passes to the Supervisor clients' create-requests and queries, and handles the responses. By default, an index is saved on the node on which it is created. Each index is created on one bucket only; but multiple indexes may be created on a single bucket. Standard: The supervisor process persists to disk all changes made to individual indexes. Each index gets a dedicated file. Writes can either be append-only or write with circular reuse, depending on the write mode selected for global secondary indexes. Memory-Optimized: Indexes are saved in-memory. This provides increased efficiency for maintenance, scanning, and mutation. efficient index maintenance and index scans. A skiplist (rather than a conventional B-tree) structure is used; optimizing memory consumption. Lock-free index-processing enhances concurrency. For more information, see Index Storage Settings.